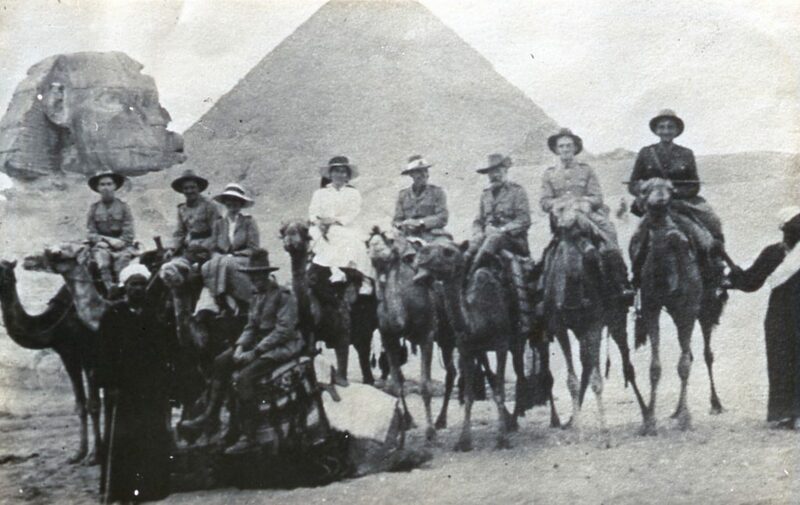 ABOVE: A batch of First Australian Imperial Force soldiers and nurses mount camels at the start of one of the numerous, impromptu “guided tours” of the ancient sights of the Holy Lands, as organised by Canon Garland soon after he took up his chaplaincy duties in the training camps located not far from the base of the pyramids (outside Cairo) in late 1917. Later, as Senior Chaplain (Church of England) to the AIF in the Holy City of Jerusalem, Padre Garland (like a number of other chaplains) took great delight in leading small parties of Diggers, dignitaries and other off-duty Empire military personnel on tours of places mentioned in the Old and New Testaments. Canon Garland (wearing a slouch hat with a distinctly Boer War-style bash) is on the third camel from the right in this photo. Won’t you “follow us” on Twitter! and “friended us” on Facebook! You’d be most welcome to join our FB Canon Garland Memorial Society group page. The citation read out for our Ross Hielscher’s 2018 Griffith Australia Day Award, presented on 28 January 2018. The text of the Lord Mayor of Brisbane’s citations for his 2018 Australia Day Awards. Our Con Drozdovskii was the recipient (on 24 January 2018 at a glittering Civic Reception in Brisbane City Hall) of an Australia Day Achievement Award in recognition of his 50-plus years of service to community-based, civic-minded volunteer groups in the City of Brisbane. The text of the public lecture, “Brisbane Anglican Chaplains and the Prussian Menace, 1914-1918”, delivered by historian, the Reverend Canon Dr John A. Moses, at Brisbane’s St John’s Cathedral on Wednesday afternoon, 5 October 2016. Nat Wallace’s report about “The Architect of ANZAC Day” from 9News Brisbane on 22 April 2016. An article by Kate McKenna from “The Sunday Mail” of 24 April 2016, headed “Paying respects down to chaplain”. 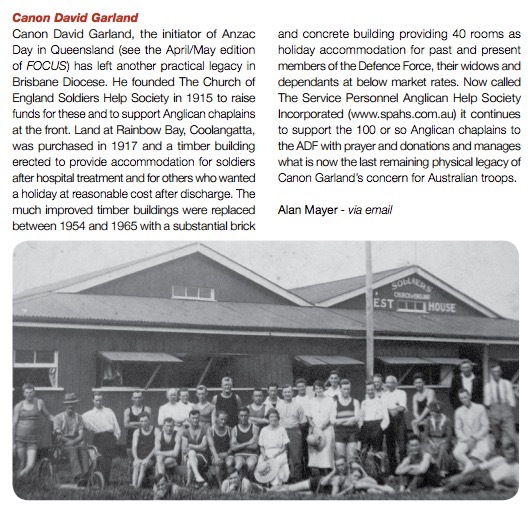 ABOVE: John Austin’s article that appeared in the Anglican Diocese of Brisbane’s newspaper, “Focus” in April-May 2012 (page 5), talking about Canon Garland’s legacy at St Barnabas’ Church, Ithaca-Red Hill Parish, on Waterworks Road, Red Hill, Brisbane. ABOVE: Canon Garland was instrumental in the formation of The Soldiers’ Church of England Help Society. 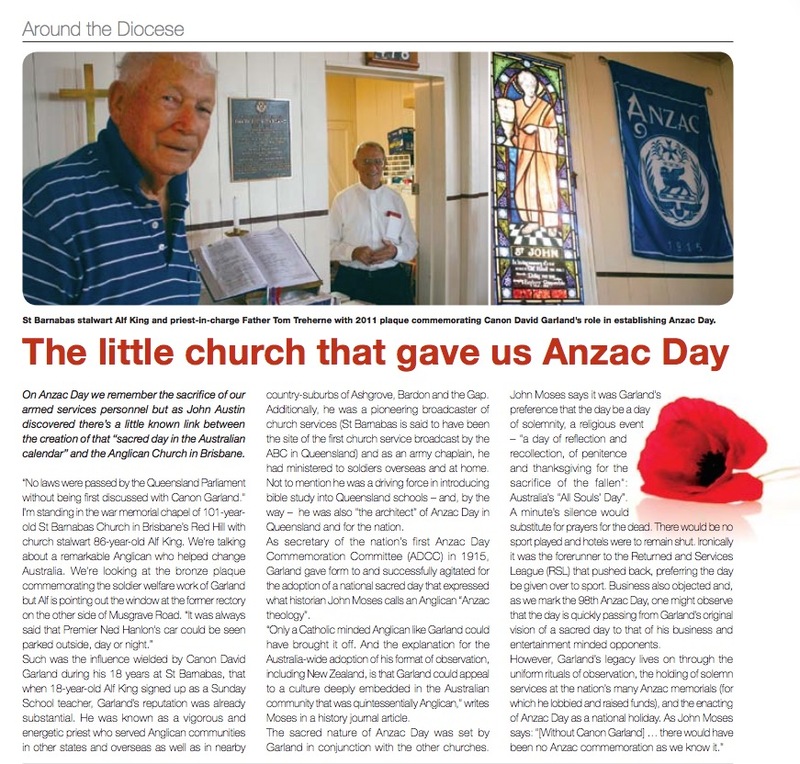 This article appeared in the Anglican Diocese of Brisbane’s monthly newspaper, “Focus”, for June-July 2012 (page 5).